Home » How to Generate Savings » Are You Taking Action To Protect Your Health Plan Against Extreme Drug Price Increases? Are You Taking Action To Protect Your Health Plan Against Extreme Drug Price Increases? You’ve undoubtedly heard that Turing Pharmaceuticals purchased a low-cost drug, Daraprim, and raised its cost by 5433% last year. And Turing’s smug CEO, Martin Shkreli, defended the price hike as perfectly reasonable. But are you aware that several other drug manufacturers are continually purchasing drugs and dramatically increasing their prices? And do you know that during the past 12 months the prices of almost 150 brand drugs increased by 100% or more? Most important of all: Do you realize that as your Plan’s administrator, you can take steps to protect your Plan against some of these outrageous price increases? And if you do so, you will not only reduce your Plan’s costs, but also do your part to end manufacturers’ relentless greed? Our firm’s experts regularly review for our National Prescription Coverage Coalition Members and for our other clients the increase in AWP of every brand drug on the market. Our goal is to provide critical information to our clients to ensure they can control their costs. Our simultaneous goal is to do what we can to transform the marketplace. To help you accomplish these goals too, we are now providing you with our most recent AWP financial analysis. If you right-click on this link, and then click on “open in new window,” you’ll see a spreadsheet showing: The name of every brand drug (column A); each drug’s manufacturer (column C); the Medi-Span AWP of each drug at the beginning of June 2015, December 2015 and June 2016 (columns F, E and D); and the 6 month and 12 month AWP increases of each drug (columns G and H). You’ll also note that our experts sorted all drugs by their annual percentage AWP increase, from the highest to the lowest increase. See column H.
Run your eyes down column C and you’ll see that several manufacturers’ names repeatedly appear (like Valeant, American Pharma, Spectrum and Mallinckrodt). You’ll also see the names of several of the world’s largest manufacturers (like Pfizer, Baxter and Glaxo). Run your eyes down column H and you’ll see just how many drugs had staggering price increases during the past 12 months. Some of these drugs may be familiar, like the proton pump inhibitor Zegerid (691% increase) and the sleeping pill Restoril (50% increase). Others may be drugs whose names you do not recognize. But for every drug that our experts marked in red font, there is a far lower-cost alternative drug that your plan beneficiaries can easily use. Look at Column K and you’ll see that our experts provided examples of alternative products, as well as estimates of how much can be saved per script by using the alternative products. Why would your Plan pay for any plan beneficiary to use prescription Zegerid, which was outrageously priced in June 2015 with a per capsule AWP of $15.34, but now has an even more outrageous per capsule AWP of $121.35? After all, every plan beneficiary can easily obtain 42 capsules of over-the-counter Zegerid from Amazon for less than $20. Similarly, why would your Plan cover the costs for any plan beneficiary to use the prescription sleeping pill Restoril, when its manufacturer raised its already-staggering per pill AWP from $15.74 to $23.60? After all, every plan beneficiary can obtain a full 30 day prescription of the identical drug as a generic for about $10. The diabetes drug Glumetza: Given Valeant’s staggering AWP increase of 800%, Glumetza now has a total AWP price, depending on dosage level, of just under $2,000 or just over $4,000 per 30 day prescription. Generic metformin ER is available for $5 for a 30 day prescription. The antidepressant/antipsychotic Tofranil PM: With Mallinckrodt’s 200% AWP increase, Tofranil PM now has a total AWP for a 30 day prescription of about $2200. A generic alternative is available for $150 per 30 day prescription. The skin treatment Keralyt 6% gel: Given Summers’ AWP increase of almost 600%, your Plan will spend approximately $300 for a beneficiary to treat his calluses or certain other skin problems. Your Plan could instead pay for an OTC alternative that would cost about $22. 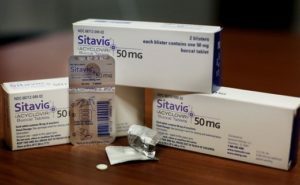 The cold sore treatment Sitavig: With Sitavig’s AWP increase of 167.5%, its total AWP per prescription is about $535. Your Plan could instead spend about $17 for the OTC cold sore treatment Abreva. Note that brand manufacturers almost never submit clinical evidence to the FDA that their brand drugs are more effective – or safer – than lower-cost alternatives. For example, individuals using cold sore treatments – like Sitavig – can expect their cold sores to heal 12 to 24 hours sooner than if a placebo is used. (1) Given that fact, do you think it makes sense for your Plan to spend $500+ per prescription for Sitavig? Given all the above facts, does it make sense for your Plan to continue to subsidize Restoril’s manufacturer, Mallinckrodt, when it raises Restoril’s AWP by 50%? If you’re tired of having your Plan’s assets plundered by manufacturers’ greed, you can do something about the problem. Stop Coverage: If you have no – or very little – usage of certain drugs, you should stop covering those drugs as soon as you can, to prevent people from starting to use them. If you already have considerable use of any drug, you can still stop covering the drug. But to minimize complaints, you’ll need to educate the drug’s users about why you’re ending coverage. More on that later. Ask for Voluntary Action: If you don’t want to end coverage of certain drugs, you can try a different approach: Direct your PBM to write the users of each drug and ask them voluntarily to go to their doctors and request less-expensive substitutes. Simultaneously implement a new program – “Do Your Part – Use Drugs Wisely” – via every form of “messaging” feasible: Robo-calls, email communications, newsletters, website posts. Few Plans have tried this “voluntary” approach, but it may be just what is needed to generate a paradigm shift in the way our society thinks about drugs. After all, decades ago, no one wore seat belts in cars, or helmets when biking, and everyone tossed their cigarette butts on sidewalks. But we’ve come a long way since then. Societally, we need to alter the way we think about and take drugs. We need people to stop feeling entitled to – and to stop wanting access to – any and every drug, regardless of the drug’s efficacy, safety or cost. We need everyone to insist upon getting information about every drug they take – its efficacy, its safety, and yes, its cost. Asking your plan beneficiaries to voluntarily forego high-cost drugs when lower-cost therapeutically identical or similar drugs are available is a perfect place for them to start doing their part to change the marketplace. Implement a Mandatory Generic Program: If you doubt whether a voluntary program will be successful, you can instead implement a Mandatory Generic Program. Tell your PBM to cap the amount you will pay for the specified brand drug at the amount of the lower-cost therapeutic substitute. Then tell your beneficiaries that if they want to continue to use the high-cost drug, they will have to pay the difference between that drug and the lower-cost generic (or OTC) substitute. This will put the onus on your plan beneficiaries to decide if the higher-cost drugs are truly worthwhile. Implement a Savings Program: If your PBM contract allows your Plan to customize your Step Therapy or Prior Authorization Programs, do so. Don’t assume that your PBM is paying attention and continually updating its “standard” Programs. It’s virtually certain that it’s not. So you must! Assuming your PBM contract allows you to customize your Programs, tell your PBM that you want to do so, and solicit help from experts (like our firm) to develop the appropriate “tight” protocols for these Programs. Then require your plan beneficiaries to try one – or several – lower-cost alternatives before you provide access to the higher-cost drugs. After all, if there’s no reliable evidence that a high-cost drug is better than lower-cost alternatives, doesn’t it make sense for your Plan – and all beneficiaries – to try lower-cost drugs first, and only use higher-cost drugs if the beneficiaries discover the lower-cost drugs don’t work? Note: If your PBM contract doesn’t allow you to customize your Programs, this is a sure sign that you should put in place a better contract as soon as you can terminate your contract. Educate Your Beneficiaries: Tell your beneficiaries just how much the manufacturer raised its AWP, and just how much the drug is costing their Plan. Articulate that everyone must band together to end manufacturers’ outrageous price increases. And make clear to your beneficiaries that they can have an enormous impact on the entire marketplace, if they’ll just do their part and pay attention to drugs’ costs. Also, point out that if all beneficiaries stop using outrageously priced drugs that have far lower-cost substitutes, the assets of the Health Plan and company will be conserved. And that will enable their Plan – and their company – to have money to use for other purposes, including higher wages and other benefits. In the spreadsheet, we focused on drugs with AWP increases over 50%. Below that figure, we highlighted a smaller number of drugs that have readily available substitutes and are (i) drugs with very high costs; and/or (ii) very high usage; and/or (iii) drugs sold by two manufacturers that have repeatedly jacked up their prices by outrageous amounts: Valeant and Mallinckrodt. As you’ll likely notice, our spreadsheet also identifies several drugs that aren’t even FDA approved. Even though your Plan may have instructed your PBM to only cover FDA-approved drugs, it’s reasonably likely that your PBM is allowing non-approved drugs to be dispensed and invoicing your Plan for those drugs. You should end coverage for all these drugs too. And you should explain to your beneficiaries why you are doing so: They shouldn’t risk their health by using drugs that have never even been approved by the FDA. Our experts regularly analyze AWP increases – and regularly provide information to our clients – to help them decrease and control their costs, as well as to do what we can to combat manufacturers’ widespread greed. As a result, our clients have eliminated or decreased the use of many drugs that have had astronomic price increases, and they have thereby controlled their Plans’ costs. Is there any rational reason why you wouldn’t do so? After all, if you stop paying for as many drugs as feasible that have enormous price increases, you’ll decrease your Plan’s costs, conserve your Plan’s assets, encourage wiser drug use by your Plan beneficiaries, and help improve our healthcare marketplace, which is in desperate need of transformation. To read other Rx Drug Alerts published by our firm, go here. (1) “Drugs for Cold Sores: How Well Do They Work?” Worst Pills, Best Pills Newsletter, May 2010. (2) See package label and multiple articles on the internet. (3) “Systematic review of the benzodiazepines. Guidelines for data sheets on diazepam, chlordiazepoxide, medazepam, clorazepate, lorazepam, oxazepam, temazepam, triazolam, nitrazepam, and flurazepam. Committee on the Review of Medicines”. Br Med J 280(6218): 910–2. March 1980. (4) Kales A, Bixler EO, Soldatos CR, Vela-Bueno A, Jacoby JA, Kales JD, “Quazepam and temazepam: effects of short- and intermediate-term use and withdrawal“. Clin. Pharmacol. Ther. 39 (3): 345–52. March 1986. (5) “All Sleeping Pills Are Still Risky, But Safer Alternatives Exist”, Worst Pills, Best Pills Newsletter, December 2013.